The Taliban have announced that their 2014 “spring offensive” will begin imminently. Spring is in the air in Afghanistan as the Taliban warned on Thursday that they will launch their annual spring offensive next Monday. 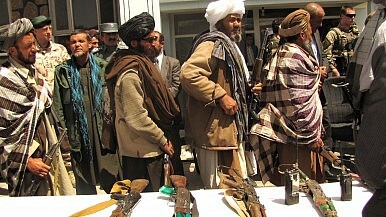 The insurgents vowed to fight on as the United States and NATO withdraw most of their troops from the country this year, only leaving behind a small contingent force should the Bilateral Security Agreement (BSA) between the U.S. and Afghanistan, and the Status of Forces Agreement (SOFA) between NATO and Afghanistan, get signed. This year’s spring offensive is particularly concerning given that Afghanistan is currently undergoing a democratic transition — the first such transition in its history as a democracy — and new threats of violence by the Taliban could offset the confidence fostered by the elections. Traditionally, the spring offensives have been the Taliban’s opportunity to “surge” against Kabul following a period of relative hibernation during the winter when most insurgents fall back to the mountainous Afghanistan-Pakistan border. This past winter, the Taliban continued to stage attacks against the Afghan government well into the winter given that elections were upcoming. Just prior to the elections on April 5, Taliban insurgents attacked the Independent Election Commission, the Interior Ministry, and housing compounds. Additionally, the Taliban attacked civilian targets such as hotels and restaurants in an effort to create an air of insecurity in Kabul and other cities. The spring offensive this year is acutely tied to the Taliban’s failure to derail the elections and will likely focus on attempts to either delay the run-off vote or make transition very difficult for Afghanistan’s next president. No presidential candidate acquired a majority of the votes on April 5 which means that Afghanistan is headed for a run-off vote between the two candidates who received the most votes: Abdullah Abdullah and Ashraf Ghani. Both leaders are pro-Western and have indicated a preference to sign the agreements that would allow the U.S. and NATO to maintain some forces in Afghanistan beyond this year. Italian Maj. Gen. Antonion Satta told the Wall Street Journal that given the high turnout and relative stability during the April 5 elections, the Taliban have lost a good deal of credibility as a threatening fighting force in Afghanistan. “They lost credibility, so we are expecting them to try to prove they are still able to achieve something,” said Gen. Satta. Evidence that the Taliban’s primary objective at this point is the destabilization of the run-off election and presidential transition isn’t hard to find. The group’s attack on the Independent Election Commission in March already significantly delayed the IEC’s ability to quickly process a run-off election. “The election law says that a run-off must be held two weeks after the final results’ announcement, but the Taliban launched a rocket attack, and as a result of the attack we lost some of our critical materials, therefore, we will not be able to hold a run-off after two weeks,” IEC Chairman Ahmad Yusuf Nuristani told Tolo News. For now, the first objective of Afghan security forces and foreign troops should be to allow Afghanistan to carry on with the democratic momentum sparked by the elections on April 5. A swift and violence-free run-off vote is crucial at this time.